Closets are useful storage space, but over time, they tend to accumulate tons and tons of junk! Step one to having a clean, organized space is having somewhere to put your stuff. It is so much easier to clean house (and find things again afterwards) if everything has a place. We moved into our house two and a half years ago, but it took me a good two years to really get organized. Moving is tough -- especially if it is to a different city because you move everything all at once! The linen closet was my first project. This houses all of my cleaning supplies; so, it made sense to organize it first and move on from there having all cleaning tools within easy reach. I went to the dollar store and got 6 containers: 3 tubs and 3 baskets with holes. Total cost: $6. Shelf #3: Three baskets containing kitchen towels, wash cloths, and bath hand towels. On the sides, I have misc things: table cloths and placemats. Shelf #4: Three Buckets containing "Specialty" cleaning supplies (examples: lint roller, dusting cloths, and washing machine cleaning tablets), regular "Cleaning" supplies (examples: sanitary wipes, class cleaner, multi-purpose cleaner), and "Extra Toiletries" (example: extra toothpaste, toothbrushes, and deodorant). Shelf #5: Big bottles. I've got bulk hand sanitizer for refilling the tiny bottle I carry in my purse, bulk hand soap and dish soap for refilling all the containers in the house, bleach, drying aid for the dishwasher, etc. There is one thing here that doesn't belong: a package of foil cooking containers. I use them for making freezer meals, and they just sort of ended up here. It doesn't really bother me since they are a bulk kitchen item just like the napkins and Ziploc. Floor: A broom exclusively for sweeping up cat litter. This closet is right next door to the laundry room -- where we keep our cat box. The kitchen pantry used to be stuffed full of various food items. 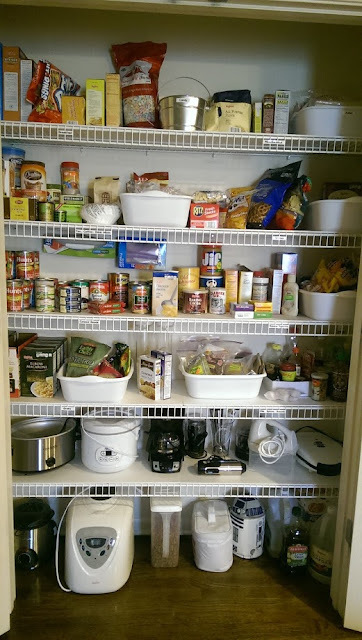 An organized pantry will save you money because it is much easier to see what you have on hand -- thus not buying duplicates. Again, I went to the dollar store and bought 10 foam poster boards and 6 tubs. Total cost: $16. I used the poster boards to cover the annoying wire shelves. I cut the excess off to fit and actually ended up using this extra foam board whenever I organized my bathroom. I used my label maker again to label the buckets and the front of each food section. Shelf #1 (going down and left to right): Breakfast items, candy bucket, extra flour/sugar, and "Asian" food ingredients (mostly for making sushi). Shelf #2: Drink mixes (tea, coffee, hot cocoa) and a bucket of more drink mixes, including boba pearls and straws. Snack and lunch foods, such as chips, pretzels, crackers, and a bucket for snack bars and the like. Shelf #3: All canned goods, Ziploc bags in use (hanging from the wire shelf above), and all baking items. The bucket holds baking chips, nuts, marshmallows, etc. Shelf #4: All grains. Pasta, rice, lentils, etc. The bucket contains bulk spices, and on the far right, are all our non-refrigerated sauces, including honey and syrup. Shelf #5: Before I organized the pantry, shelf 5 was also full of food items. The buckets made a world of difference! Everything is contained, and I am able to use my fifth shelf to store kitchen tools: slow cooker, rice cooker, coffee pot, immersion blender, hand mixer, and waffle iron. These items were originally houses in the kitchen cabinets, and since they have moved to the pantry, I gained a lot more room in my cabinets! Floor: Deep fryer, bread maker, cat food, lunch boxes, and bulk oil and vinegar. So, there it is. 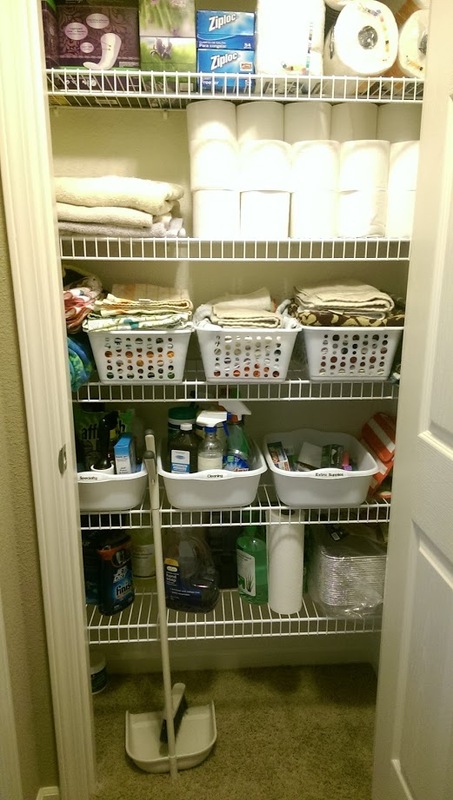 My pantry and linen closet are organized and functioning wonderfully. I know you may not have the same types of things I do, but the key is grouping what you have. Keep like items together to make finding them easier. Woa, is that a bag of dehydrated marshmallows on the first row?